Flypast marks Battle of Britain Jump to media player Aircraft including 18 Hurricanes and six Spitfires flew over south-east England to mark 75 years since the Battle of Britain's "Hardest Day". Spitfires soar in WWII memorial Jump to media player Twelve Spitfires take to the skies to commemorate the 75th anniversary of the Battle of Britain. Flypast for Battle of Britain anniversary Jump to media player A flypast of historic and current Royal Air Force fighter planes marks the 75th anniversary of the start of the Battle of Britain. 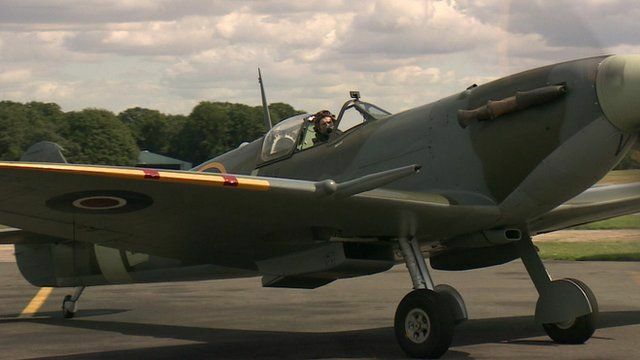 Close up with the Battle of Britain planes Jump to media player The BBC's Danny Savage has been taking a closer look at some of the planes taking to the skies as part of this year's commemorations for the 75th anniversary of the Battle of Britain. Cockpit view of Battle of Britain flypast Jump to media player A view from the cockpit as aircraft, including Hurricanes and Spitfires, take part in a flypast to mark the 75th anniversary of the Battle of Britain. Mass fly-past at Royal Air Tattoo Jump to media player More than 65,000 spectators attended the Royal International Air Tattoo at RAF Fairford, where a mass fly-past of historic planes was staged. Flypast marks Battle of Britain Jump to media player Aircraft, including Hurricanes and Spitfires, have flown over Buckingham Palace to mark the 75th anniversary of the Battle of Britain. Seventy-five years ago, the sky above south-east England was the scene of the most intense day of fighting during the Battle of Britain. This was known as the "Hardest Day" and was commemorated on Tuesday, when Spitfires and Hurricanes were again in action.